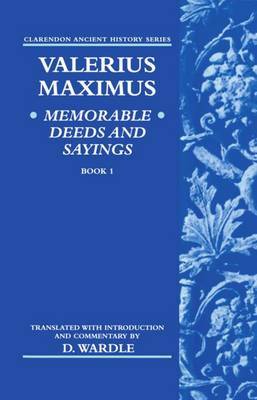 Valerius Maximus stands alone as an extant prose author of the early principate who devoted specific interest to the Romans' attitude to religion. In eight chapters he presents a variety of material selected from earlier authors, such as Cicero, Livy, and Varro, to illustrate central areas of Roman religious thought and practice: augury, omens, dreams, and miracles. Valerius has not been translated into English since 1678 and there has never been a detailed commentary on his work in any language. With the growing interest in the non-Judaeo-Christian religions of the Mediterranean world and scholars recognizing that Roman religion should not be approached with Judaeo-Christian presuppositions or through the filter of the Christian Fathers, Valerius Maximus gives us an opportunity to see an unexceptional pagan speaking about his religion.